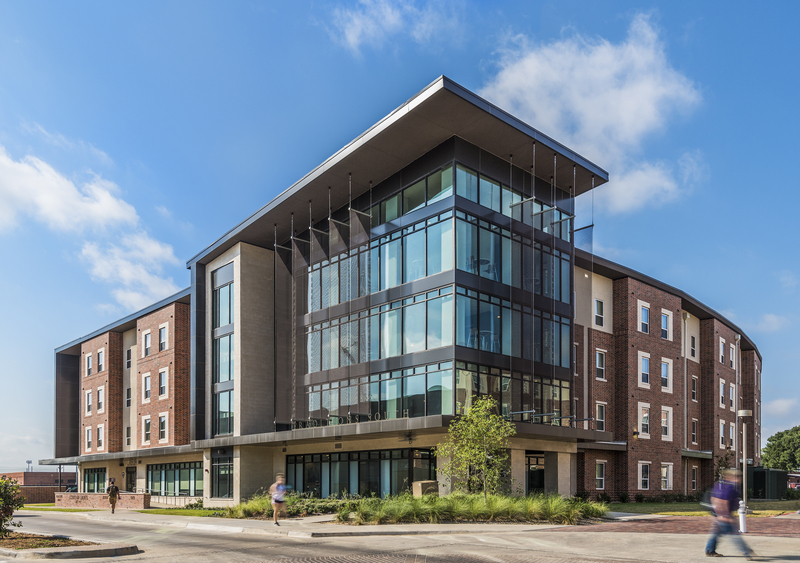 The growing academic institution demanded additional residence halls, which came in the form of two new, modern on-campus buildings – Traditions Halls – designed to be both a “living and learning” home for more than 500 students. Social spaces with floor-to-ceiling windows are a key feature of each building, acting as “lantern-like elements” along the bisecting pedestrian route, Rudder Way. The large expanses of glass raised questions about solar performance during the day, according to Eric Van Hyfte, principal at BOKA Powell Architects. The project team needed a material that fit with the existing design blueprint and fulfilled their solar shading requirements. 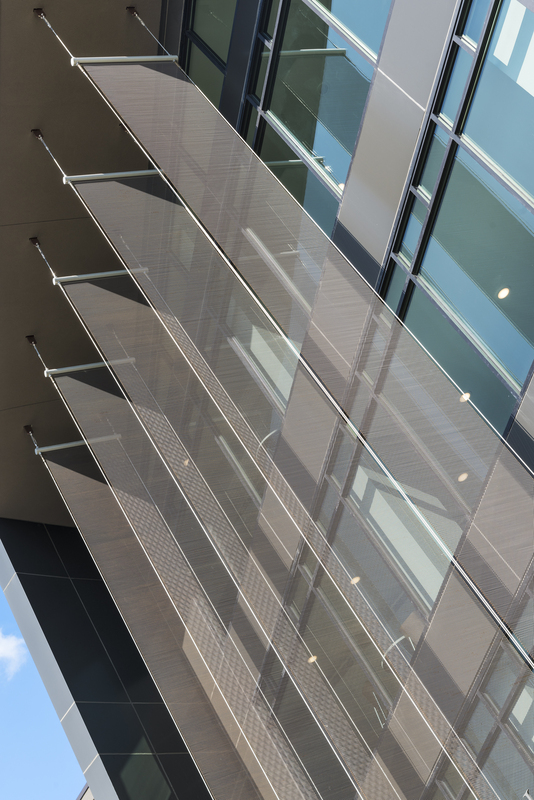 BOKA Powell called upon Cascade Architectural for Fabricoil solar shading panels – a budget-friendly material with translucency that controls the amount of sunlight entering a building. In addition, the lightweight, semi-transparent coiled wire fabric panels maintain views of the surrounding campus for students inside. “We explored several options for vertical sunshades, and ultimately selected Fabricoil due to its durability, functionality, and aesthetic qualities,” says Van Hyfte. Cascade Architectural offers customers an assortment of high-quality metal wires to create their own unique coiled wire fabric systems. Fabricoil is available in an array of finishes and customizable colors – allowing architects and designers to define their project’s aesthetic and express their creativity. BOKA Powell specified copper-clad steel wire, which was intentionally left bare and exposed to the elements so that it would age. The original fabric has visually morphed—initially into a brownish hue, and ultimately into the bronze patina that exists today. 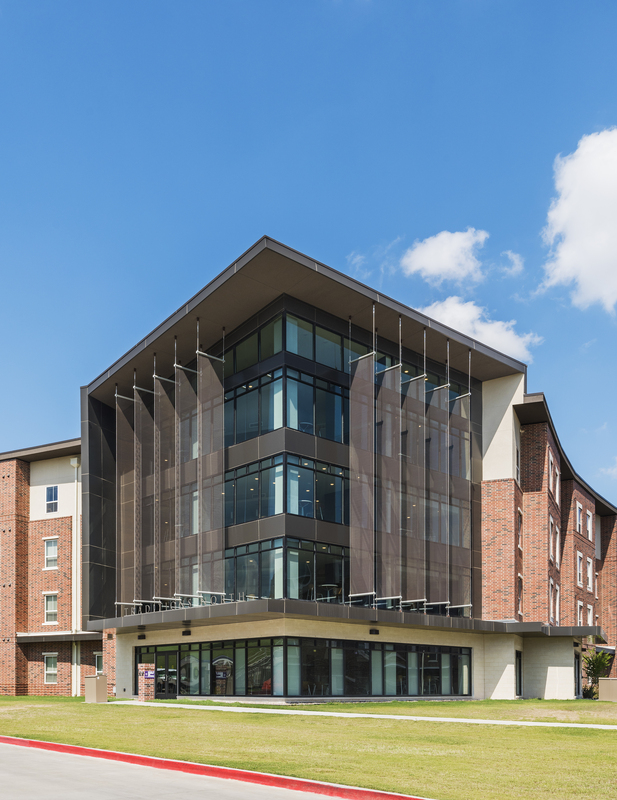 For Traditions Halls, Fabricoil is secured in Cascade’s Express with Suspension Cables attachment system. The vertical cables give the panels a floating appearance, oriented to provide relief from the intense Texas sun. “The gradated translucency of the overlapping panels, and the shadows they cast, create a beautiful effect that animates both the interior public spaces and the pedestrian mall,” Van Hyfte says. The Traditions Halls were completed in August 2016. In addition to Cascade Architectural, the project team included BOKA Powell Architects and Balfour Beatty Construction.